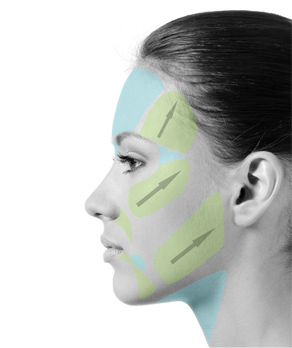 In the early stages of facial ageing, the oval outline of the face (jaw contour) is affected by the appearance of small ptoses of the cheeks, and the neck is affected by the appearance of platysma bands. Non-surgical facial rejuvenation can thus be conceived by injections of filler product (hyaluronic acid, Radiesse) possibly in combination with injections of botox (botulinum toxin). These injections harmonize the facial contours and restore the missing volumes associated with age. This procedure performs a medical mini facelift. At a later stage of facial ageing, when ptosis of the cheek is more severe and the skin of the neck is even more lax, medical rejuvenation is no longer enough and then a facelift lift is better indicated. Improvement to the oval outline of the face can be achieved by injecting a filler product (Radiesse or hyaluronic acid) in front of and behind the cheek ptosis in order to reshape the contour of the jaw to give it a more youthful look. An injection in the vertical lip lines is also performed. The neck may be rejuvenated by injecting botox (botulinum toxin) in the neck’s platysma bands. The aim is to relax the platysma muscle whose contracture due to ageing is partly responsible for the slackening of the neck. At the same time, rejuvenation of the midface and the nasogenian folds can be carried out by injecting hyaluronic acid. Usually there is no or very slight bruising (ecchymosis) if any. Any bruising is easily camouflaged using make-up. The results of botulinum toxin injections are visible after 8 days. The result is maintained for 6 to 12 months maximum. Maintenance is carried out by means of new injections once a year.